This entry was posted in Catt Co, Catt Co Important, Catt Co Popular, Chaut Co Popular, Grand Jury, National, National Important, National Popular, State, State Important, State Popular and tagged ADA Elizabeth Ensell, Aylor, Barry Clawson, Beggs, Beth Ensell, cat county corruption, cattaraugus county, Cattaraugus District Attorney, Chief Jeff Rowley, City of Olean, City of Olean Attorney Nicholas DiCerbo, District Attorney Lori Rieman, elizabeth ensell, Elizabeth LaFleur, Elizabeth Noelle Ensell, Elizabeth Noelle Ensell LaFleur, failure to maintain right, Jeff Rowley, Officer Barry Clawson, Officer Ronald Richardson, Officer Ryan Aylor, Officer William Beggs, Olean Mayor Aiello, olean new york, OPD Ryan Aylor, OPD William Beggs, Ronald Richardson, US Attorney at the Department of Justice on February 18, 2019 by CatCoCorrupt. This entry was posted in Catt Co, Catt Co Important, State, State Important and tagged 4th Department Appellant Division, Buffalo New York, cat county corruption, Cattaraugus County New York, Cattaraugus District Attorney, District Attorney Lori Rieman, elizabeth ensell, Ellicottville New York, kelly balcom, Unified Court System of New York, William Preston Marshall on January 25, 2019 by CatCoCorrupt. This entry was posted in Catt Co, Catt Co Important, National, National Important, State, State Important and tagged 4th Department, ADA Elizabeth Ensell, cat county corruption, cattaraugus county, cattaraugus county court corruption, Cattaraugus District Attorney, Elizabeth Ensell LaFleur, Elizabeth LaFleur, Judge Ronald Ploetz, Kowalski, Lori Rieman, Ronald Ploetz, william marshall, William Preston Marshall on December 24, 2018 by CatCoCorrupt. 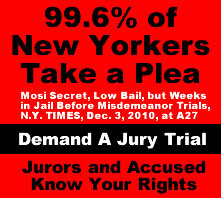 The New York Grand Jury System is one of the most powerful Grand jury systems in the world, however it has broken down because it is controlled by the very people it is intended to investigate and hold accountable; Corrupt District Attorney’s like Lori Rieman; “The primary function of the Grand Jury is to uncover crimes and misconduct in public office for the purpose of prosecution” (see NY Const, art I, § 6; CPL 190.65, 190.55). People v Tyler, 46 N.Y.2d 251, 258-259, see also People v Rao 73 A.D.2d 88 (N.Y. App. Div. 1980) . The term “a grand jury can indict a ham sandwich” was coined here in New York. So was “testlying”, the two most dangerous phrases ever to infest American Jurisprudence. 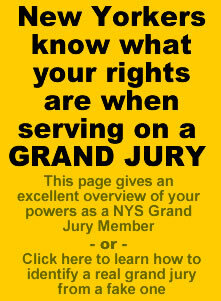 Most New Yorkers fail to understand their power when seated as a Grand Jury member. 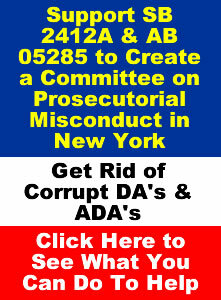 It was designed to be a “run-away” process where We the People could control and hold accountable corrupt government officials, like the many that inhabit Cattaraugus County New York found in the District Attorney’s Office. It is engrained in the New York State Constitution. Furthermore, the Grand Jury exists to protect citizens, i.e. We the People, from needless and unfounded prosecutions as well as to investigate crimes (see, e.g., People v Lancaster, 69 N.Y.2d 20 at 25 ; People v Ford, 62 N.Y.2d 275, 282 ; People v Iannone, 45 N.Y.2d 589, 594 . Information; A Grand Jury can pass down an indictment against a corrupt public official, or make a recommendation to have charges filed against a corrupt public official. In our opinion, in this age of corruption it is better that a Grand Jury indicts a corrupt public official then allow another public official to charge them. To give you an example of the power of the New York State Grand Jury System one needs to look back to February, 1934, where a New York Grand Jury made an effort to inquire into the policy racket, similar to what we have today known as ticket quotas. After eleven months of continued activity, it found itself stalemated, and handed up a recommendation that another Grand Jury take up the matter, and devote its entire time to it. The March, 1935, Grand Jury was charged with the duty of investigating all forms of organized crime, and any connection between such acts and law enforcement officials. In order that it might have a free hand and go after corrupt government officials, it threw out the corrupt district attorney running it , like corrupt District Attorney Lori Rieman we have here in Cattaraugus County New York who covers up murders . The 1935 Grand Jury, though headed by a capable foreman, made no progress . When the futility of the investigation became apparent, the Jury joined with the Grand Jurors’ Association in urging upon Governor Lehman the need of an Extraordinary Grand Jury, and a Special Prosecutor to continue the inquiry. The rackets investigation is now being conducted by a carefully selected jury, with the aid of Thomas E. Dewey, Esq., and an appropriation of a quarter million dollars . This led to the successful prosecution in New York City of criminal organizations, which in Cattaraugus County is mainly comprised of corrupt public employees, their friends and family members. Quare as to power to exclude the prosecutor. Pro: Matter of District Attorney’s Relations to the Grand Jury, 14 N. Y. Cr. 431 (1900). Contra: People ex rel. District Attorney v. Dist. Ct., 75 Colo. 412, 225 Pac. 829 (1924). Compare, the exposure of the Minneapolis system of graft which was forced through by the foreman. 2 LINCOLN STEFFEN’S AUTOBIOGrAPHY (1931) 327, 379. N.Y.Times, Jan. 17, 1935, p. 3, col. 1; 13 THE PANEL (Sept.-Oct. 1935). This entry was posted in Catt Co, Catt Co Important, National, National Important, State, State Important and tagged Article I, corruption, Discover the Secrets of the New York, indictment, new york, New York State Constitution, primary function of the Grand Jury, run-away grand jury, Secrets of the New York Grand Jury, Section 6 on December 16, 2018 by CatCoCorrupt. NY Attorney General investigating India Cummings Case. 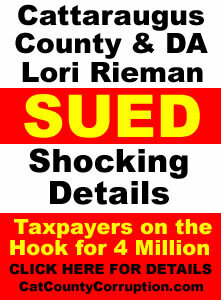 Is DA Reiman’s Conduct in Prior Case the Cause? 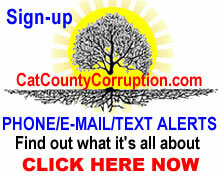 This entry was posted in Catt Co, Catt Co Important, Catt Co New, Catt Co Popular, State, State Important, State Popular and tagged 4th Department, cattaraugus county corruption, cattaraugus county court corruption, Cattaraugus District Attorney, District Attorney Lori Rieman, elizabeth ensell, India Cummings, Lori Rieman, Matthew Cross, Metcalf case, new york state corruption, NY Attorney General on September 21, 2018 by CatCoCorrupt. This entry was posted in Catt Co, Catt Co Important, Catt Co Popular, State, State Important, State Popular and tagged DWI License Suspensions, DWI License Suspensions Pending Prosecution in New York State, License Suspensions Pending Prosecution, new york state, Thin Black Line on April 20, 2018 by CatCoCorrupt. This entry was posted in Catt Co, Catt Co Important, Catt Co New, Chaut Co Important, Chautauqua County, National, National Important, National New, State, State Important, State New, Uncategorized and tagged 730.30, 730.30 motion on August 10, 2017 by catcount. This entry was posted in Catt Co, National, National Important, State, State Important, State Popular and tagged Cattaraugus County District Attorney’s Office, Elena Sassower, new york, udicial and attorney corruption on July 27, 2017 by CatCoCorrupt. This entry was posted in Catt Co, Catt Co Important, Catt Co New, Catt Co Popular, Grand Jury, Intertnational, National, National Important, National New, National Popular, State, State Important, State New, State Popular and tagged 4th Department Appellant Division, ADA Elizabeth Ensell, ADA Kelly Balcom, assault, Bridget Marshall, Bryan H Schwabenbauer, cat county corruption, catt co lawsuits, cattaraugus county, cattaraugus county corruption, Cattaraugus County Judge Ronald Ploetz, Cattaraugus County New York, Cattaraugus County Sheriffs Office, Cattaraugus County Sheriffs Sheriffs Deputy William Hunt, Cattaraugus District Attorney, Chautauqua County, Chautauqua County New York, corruption, Cory Kowalski, District Attorney Lori Rieman, DVM appeal, DVM refusal hearing appeal, elizabeth ensell, Elizabeth Noelle Ensell, Ellicottville Police Officer Cory Kowalski, Judge Ronald Ploetz, kelly balcom, NY DMV, Perjury, Police Officer Cory Kowalski, Ronald Ploetz, Sheriffs Deputy William Hunt, treason, William Hunt, William Preston Marshall on May 10, 2017 by CatCoCorrupt. 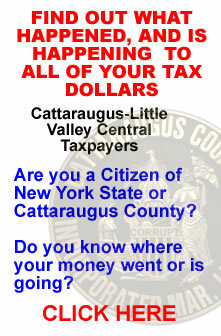 Seems like CatCountyCorruption isn’t the only one who thinks that employees within the Cattaraugus County District Attorney’s Office are a bunch of criminals. When you have a lawyer who was a former US Attorney General for eight years and stationed in Washington DC telling it like it is concerning the criminally incompetent Attorneys that work for the District Attorney’s Office, well…. Cattaraugus we have a problem…. 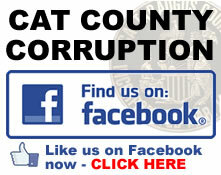 This entry was posted in Catt Co, Catt Co Important, Catt Co New, Catt Co Popular, National, National Important, National New, State, State Important and tagged ADA Elizabeth Ensell, ADA Kelly Balcom, bill marshall, cases filed against DA n catt co ny, cat county corruption, cattaraugus county, cattaraugus county corruption, Cattaraugus District Attorney, kelly balcom, Lori Rieman, preston marshall, William Preston Marshall on January 23, 2017 by CatCoCorrupt.